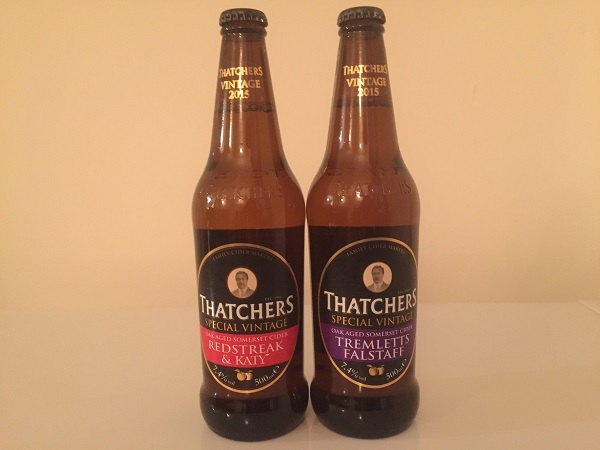 Thatchers Cider, based just outside Bristol, have announced the launch of two brand new Special Vintage Ciders: limited editions that are available to purchase exclusively from the Thatchers Cider Shop at Myrtle Farm, Somerset. Priced at £1.95 per bottle, there are two new varieties available, each containing two different apples and with a strength of 7.4%. The Somerset Redstreak and Katy uses the peppery and bittersweet Somerset Redstreak apple and the soft and fruity Katy culinary apple, creating a fine and full-flavoured cider that has a light and fragrant aroma and a soft, rounded finish. The Tremlett’s and Falstaff makes use of the bittersweet Tremlett’s apple and the light and fruity Falstaff culinary apple, with this cider having a long dry finish and a flavour that is rich and full-bodied.